There you go. 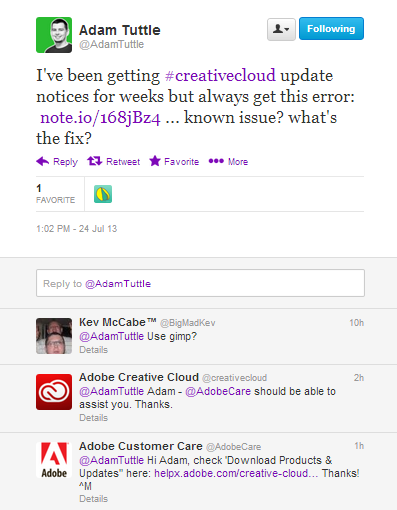 He'd had an issue with Creative Cloud, and Adobe were listening and helping within a few hours of him raising his question. On Twitter. I've been rigorously searching the adobe.com website and it appears that there is no place to download a full working version of ColdFusion 10. Any one? Scarlett: Sorry to tell you that we can only help to those who have purchased or registered the software under Adobe. So via Twitter, my namesake got personalised support. Via Adobe's own support forums, seedingideas got someone who seems to be typing from a script, whilst apparently having no idea about what the hell they're talking about. I was going to go for the cheap shot in this post and also list the 195 (yes, down from 212) ColdFusion 10 bugs that no-one at Adobe has seen fit to even triage (let-alone comment on or offer help with), but that's too obvious (but... umm... list here), which date back over the last two years. But that's a slightly different kettle of fish. I think Adam Tuttle and seedingideas's questions and follow-up experiences are more within the same realms of expectation management.